Easily repair delicate assemblies and a whole lot more with the High Pressure Glue Injector with . tips. 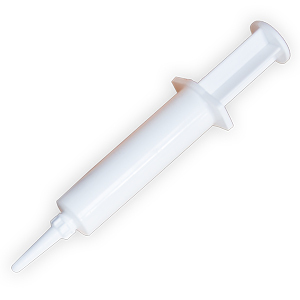 The glue Injector also works great for small crafts and hobbies. Provides up to 550 psi of pressurized power to get into the smallest of areas. Works to repair/reglue furniture joints, veneer, laminate, musical instruments and more. Use with water based glues. 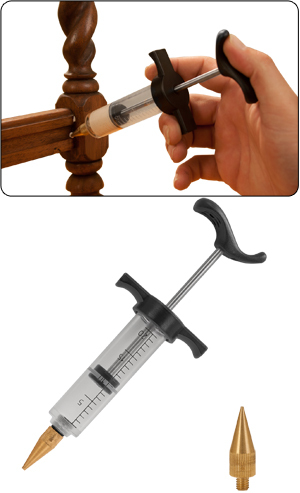 Syringe style plastic body easily injects glue with thumb pressure so glue placement is controlled. Plastic needle tip. For detail work, forcing glue into furniture joints and cracks. Capacity 15cc, includes storage cap. Designed for pin point gluing accuracy. Accord ian style plastic body easily collapses with thumb pressure so glue placement is controlled. Stainless steel needle tip will not bend or close up under pressure. For detail work, forcing glue into furniture joints and cracks, or making repairs. Capacity 1 ounce, includes storage cap. This is the perfect kit for precision glue ups and small sized projects. 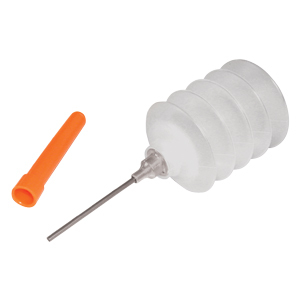 The kit includes the plastic syringe injector as well as the glue needle injector. 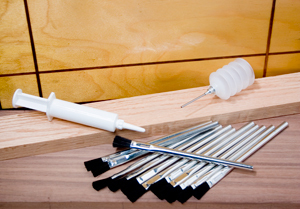 The kit also comes with twelve acid glue brushes to put the finishing touches on your glue up applications.